Another week. More games. We’ve got you covered. Women’s Soccer started the game off quick against Elizabethtown on Wednesday night. The Falcons took a 2-0 lead in the first 10 minutes, scoring on their first two shots. First-year player, Kayla Herr, scored her first career goal in the game. The Falcons won with a final score of 4-1. On Saturday, the team was in action against Misericordia University. It was a close match as the game remained scoreless until the 80th minute. 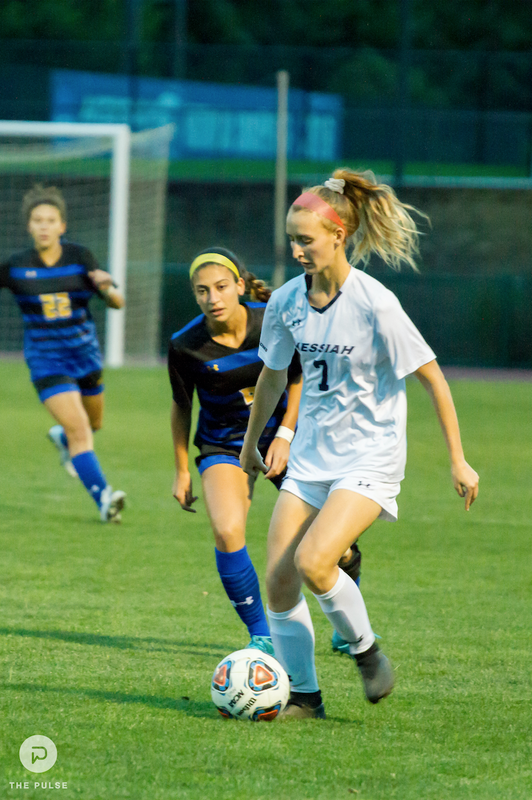 Sophomore Maddie Kohl gave Messiah the 1-0 lead, which would prove to be enough as the women went onto win their seventh game of the season. Goalkeeper Sarah Yunez saved four shots in the win. Men’s Tennis fell to the University of Scranton 6-3 on Saturday. Jarod Snader and AJ Swanson led the team, winning their doubles match 8-4. Individually, both men won their singles matches. Snader won both of his sets 6-0, while Swanson won his sets 6-2, and 6-3. Women’s Volleyball was 1-3 on the week. The team lost to Arcadia University 3-0. Arcadia won the sets, 25-21, 28-26, and 25-15. Kate Preudhomme, Mary Underman, and Hannah Berger each earned six kills in the loss. Over the three sets, the Falcons averaged a .104 hitting percentage. The Falcons rebounded Friday night in their win against Frostburg State University to open up the Hampton Inn Riverhawk Classic. Winning the sets 25-21, 25-20, and 25-18, the women were on a roll. Amanda Dahlman and Natalie Marsch had a combined total of 30 kills. On Saturday, the Falcons lost their matches against the University of Rochester (25-15, 22-25, 25-21, 24-26, 10-15) and Susquehanna University (20-25, 12-25, 16-25). Their record is now 8-6. Women’s Cross Country hosted the Messiah Invitational over the weekend. The team placed second against Mount Saint Mary’s who came in first, and Frostburg State who took third. Leigha Southall finished with a time of 24:20 and Sarah Codd finished the race three seconds later. Men’s Cross Country won the Messiah Invitational over Mount Saint Mary’s and Frostburg State. Seven runners finished in the top-10. Zachary Lofties was the first Falcon to cross the line with a time of 27:54. Field Hockey was victorious over Catholic University on Wednesday. Megan Wetzel scored both goals in the 2-1 win. The team began MAC Conference play on Saturday against Widener University. Wetzel scored her third goal in just two games. Jennie Young, Taylor Wiederrecht, and Kezia Loht also tallied for the Falcons as they beat Widener 4-1. Men’s Soccer took on York College this past Thursday. The game was scoreless until Nick West broke the tie, scoring on a free kick in the 51st minute. Connor Bell saved five shots as Messiah won 1-0. Luke Groothoff scored his first career goal in the men’s 4-1 win over Misericordia Saturday. West also scored a brace, now having scored in each of the last seven games for the Falcons. Women’s Volleyball vs Widener University 7:00 p.m.
Men’s Soccer vs Elizabethtown College (Marshmallow Bowl) 7:00 p.m.
Field Hockey @ Franklin and Marshall College 7:00 p.m.
Women’s Soccer vs. McDaniel College 7:00 p.m.
Men’s Tennis @ York College 12:00 p.m.
Women’s Tennis @ York College 12:00 p.m.
Field Hockey vs. Stevenson 1:00 p.m.
Women’s Soccer vs. Hood College 5:00 p.m.
Men’s Soccer vs. Hood College 7:30 p.m.